Piqua, Ohio, April 14, 2014 – Hartzell Propeller Inc. and Mooney International Corp. are again in business together as the aircraft manufacturer has begun production on the first new Mooney airplane in five years. 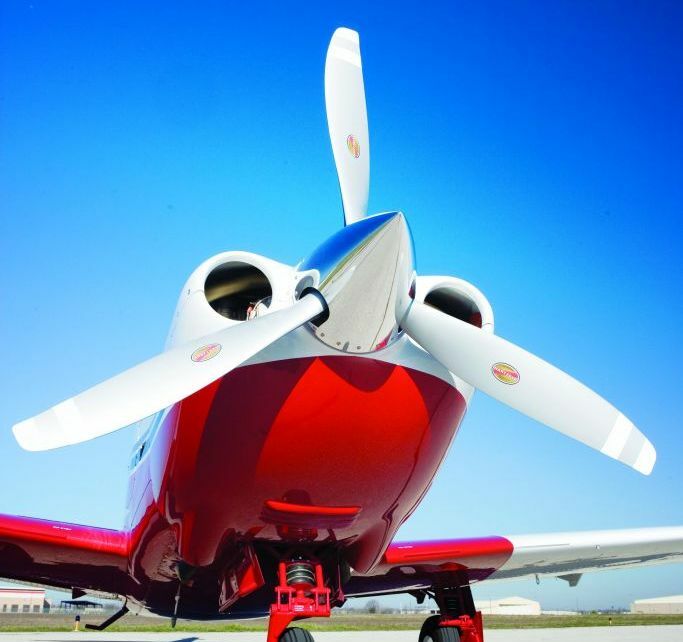 Hartzell Propeller has initiated deliveries of the company’s three-blade, blended airfoil, scimitar props to Mooney’s manufacturing operation in Kerrville, Tex., for factory installation on its Ovation and Acclaim Type S aircraft models. Nearly 10,000 Mooney airplanes have been equipped with Hartzell props. Under the most recent purchase order, Hartzell Propeller will supply propellers for all Mooney Ovation2 GX, Ovation3, and Acclaim aircraft models. New Mooney airplanes will soon be flying with Hartzell Propeller’s next generation of props featuring innovative blended airfoil technology. Hartzell manufactures these blades using a combination of revolutionary machining centers and robotics. One of the launch platforms of the original Hartzell two-blade compact aluminum propellers in the early 1960s was the Mooney M20C. Through the decades, the M20 airframe was improved with the addition of metal wings, generations of avionics, fuselage stretches, increased gross weights and more horsepower. Through most of these changes, the Hartzell compact aluminum propeller was standard or offered as optional equipment. Beginning in 1955, until production ceased in 2009, more Mooney airplanes were factory equipped with Hartzell propellers than any other prop. During recent years, Hartzell Propeller has offered high performance two- and three-blade propellers on various Mooney models as operators upgrade the props on early model M20 aircraft through Hartzell Propeller’s Top Prop program. In its 85-year history, Mooney has manufactured and delivered more than 11,000 aircraft worldwide. Today, more than 7,800 customers in the United States and 1,000 overseas fly Mooney’s proven, high-performance airplanes. For more information, visit mooney.com.